Our Flower in the Rain Bracelet is inspired by the moment just after the rain when the powerful scent of fresh rain takes over the surrounding. Who wouldn't love the lingering sweet petrichor, right? 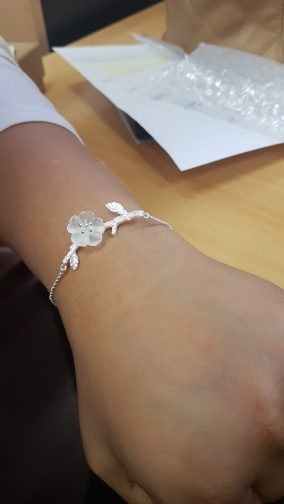 Made of 925 sterling silver, the approximate length of Flower in the Rain Bracelet is 16cm(Length) x 3cm(Width). This romantic-looking bracelet also comes in two variants of white and pink gem colors. We are proud to introduce you to our Flower in the Rain Bracelet as part of our newest collection. Each of our jewelry pieces is handmade with great details and care. Our mission is to use jewelry pieces as part of our belief in stopping deforestations all over the world, protecting the oceans, and fighting against global warming. The quality of products are amazing. Im pretty sure that this is the best seller of silver jewelry I found so far. I have ordered things since they looks beautiful and have exceptional style, but didnt expect such a good service which i got from Lustrousologu team. Moreover i had some issues with local customs, but seller helped me to solve this in most efficient and short way. Thanks them! Defiantly buy from them again.